Two regular slots and two extra-wide, single-sided slots combined into one flexible toaster model. Double-sided slots accept breads, Texas toast, frozen waffles, and English muffins. Extra-wide single-sided slots toast bagels and buns. 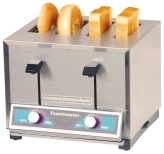 HT-400 series "Combo" Toasters: Two regular slots and two extra-wide, single-sided slots combined into one flexible toaster model. Double-sided slots accept breads, Texas toast, frozen waffles, and English muffins. Extra-wide single-sided slots toast bagels and buns.